Hello all, we are recruiting. 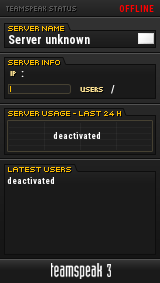 Maybe you could provide a little bit more information, such as your website, whether or not you use teamspeak, maybe a link to your clan Battletracker. Probably a lot more information someone would need to consider joining your clan. yeah bro i know it . is just a way to start a clan . little time and little time we recruit..
You guys are pt right? I know some guys were looking for a pt clan.